Satori Farm Retreat - How YOU Can Help! Sign the Petition against EMC! We are currently facing a February 22nd, 2012 eviction at 9:00 am stemming from a fraudulent foreclosure sale. 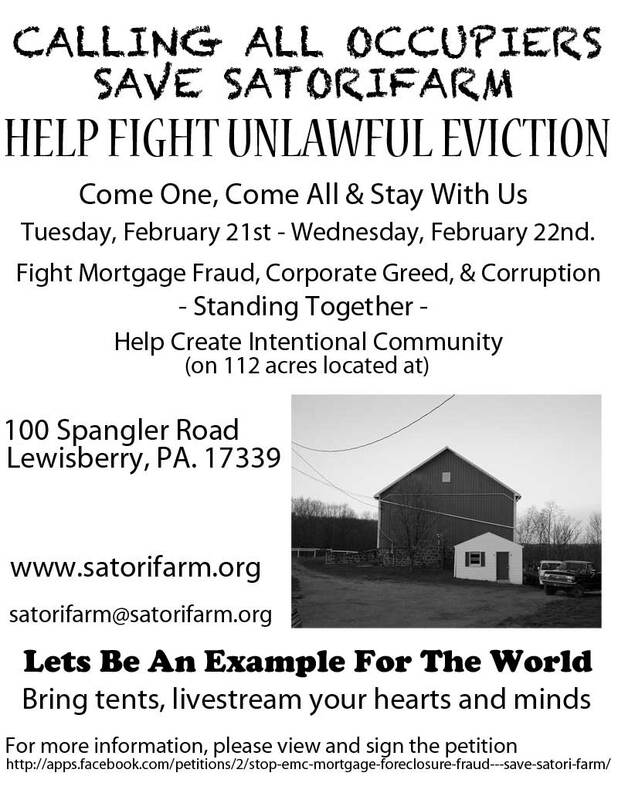 Learn about the fraudulent foreclosure action being brought by EMC Mortgage against Satori Farm and help Take Action! Lynn Szymoniak, esq., is a nationally recognized expert on foreclosure fraud and has trained the FBI and CIA on examining and detecting fraudulent documents. Lynn has verified this to be a fraudulent foreclosure. Szymoniak Exhibit A - The Fraudulent Assignment of Mortgage - backdated and robo-signed, see for yourself! Transfer of Mortgage by Sunset Mortgage to Saxon Mortgage - this somehow occurred two weeks before the alleged loan even originated. Sign the Petition against EMC mortgage for filing a fraudulent foreclosure against Satori Farm! Note: To be considered for publication, a letter must include the writer's name (no initials or pen names), address and telephone number. We don't publish copies, form letters, poetry or letters addressed to anyone other than the editor. We routinely edit for length, accuracy and clarity. Please limit your letter to 200 words. Please write no more than once a month. All submissions become the property of The Patriot-News Co. Submissions may be edited and may be published or otherwise reused in any medium. I am writing this testimony to raise awareness and support for Satori Farm, Stephen Conklin Sr., his 84 year old father, and his family, who are victims of the Mortgage and Foreclosure Fraud crisis sweeping the nation. Since 1997, Mr. Conklin has been trying to expose the fraudulent foreclosure proceedings being brough against him. He has been harassed and intimidated by the Pennsylvania Courts and I feel much of it is in retaliation for him "blowing the whistle". During this timespan, he has uncovered a serious amount fraud in his particular foreclosure case which includes robo-signing, fraudulent verifications, fraudulent assigments, back-dating of assignments, accounting irregularities, securitization fraud, copy and pasting of his signature to forge settlement documents, perjury, racism, collusion, and corruption. There is plenty of well documented and factual evidence to support all of Mr. Conklin's claims. Had the courts listened to his valid claims which are well documented, verified and supported by expert witness affidavits, they could have very well prevented the foreclosure crisis from becoming the nationwide epidemic that it has over the years. All they needed to do was give him a fair trial when he first brought all of the evidence to light. In 14 years, he has never been given that Constitutional right or proper due process. Instead, he is followed, harassed, and intimidated by deputies as soon as he walks into a courthouse, yet he has never once been anything but honest, calm, and diplomatic within the court system. Let him cross examine witnesses. Let him present the overwhelming amount of evidence to prove his claims are completely with merit. His Constitutional rights are being completely deprived and due process has been ignored in favor of a high powered law firm representing EMC mortgage. EMC recently settled with the FTC for an amount over $28 million as a result of filing fraudulent foreclosure paperwork. Lynn Szymoniak who was recently on 60 minutes, and trained the CIA and FBI on fraudulent documents, has verified the fraud and submitted not one, but two expert witness affidavits to prove the assignments and verifications are completely fraudulent. Why won't the court acknowledge this evidence and rule appropriately? Janus Handwriting Experts have also verified numerous instances of fraud being committed, including cutting and pasting Mr. Conklin's signature to create a settlement sheet to rush a mortgage settlement. There were also defacements on the copies of the assignment of mortgage and promissory note, rendering them unacceptable for legitimate transactions. Janus also found that there were several other questionable irregularities to consider as well. During a bankruptcy proceeding Judge Mary France even exclaimed "this is bizarre" and "collusion", the latter referencing collusion between Conklin's prior counsel, Paul Lutz, and the "banks" attorney, Leon Haller, with regards to how Conklin wrongfully lost his property at an unjust sale. Judge Arthur Schack of NY has thrown out cases with just a fraction of the fraud Mr. Conklin has discovered. At recent judicial conferences in Chicago and Arizona, several panelists praised his rulings as a possible national model. Justice Schack's take is straightforward, and sends a tremor through some bank suites: If a bank cannot prove ownership, it cannot foreclose. "If you are going to take away someone's house, everything should be legal and correct," he says. 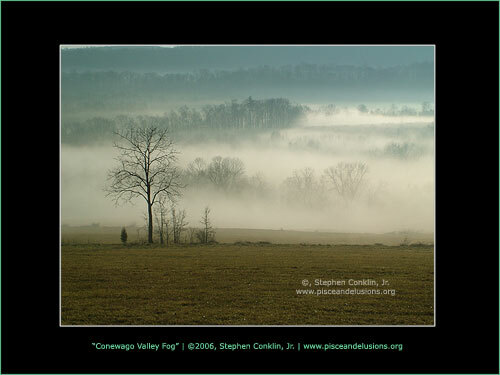 There is absolutely nothing legal and correct about the fraudulent paperwork being submitted to the Pennsylvania Courts by EMC mortgage through the law firm of Grenen & Birsic in an attempt to take away Mr. Conklin's farm. There's even proof one of the attorneys for EMC mortgage, Kristine M. Anthou, perjured herself on several occassions. How Mr. Conklin is being ignored and chastised for so many years in the PA Courts is completly mind numbing and ridiculous, to say the least. I would like to see the courts finally give Mr. Conklin a fair trial. There is more than enough evidence to suggest the entire foreclosure proceeding against him should be completely thrown out, as it is completely fraudulent, without merit, and founded on fabricated documents and lies. If action isn't taken soon, Mr. Conklin faces an eviction no later than January 31st, 2012. I am hopeful that justice can finally be granted and Mr. Conklin can finally enjoy his farm, and resume sharing it with the community, providing educational programs for the children and many other positive contributions he's made to the community over the years through his chairatble endeavors. And perhaps his 84 year old father, a union worker and veteran who fought in WWII to defend the American Dream, can finally enjoy the rest of his retirement instead of worrying about having it stolen from him and living in fear. The courts are supposed to be for the people and by the people, not for the bankers and their law firms. Thank you for your support and considerations.